Spiced apple sour cream pie is a creamy version of a traditional apple pie. Laced with traditional spices of cinnamon, nutmeg, cloves, and a bit a cardamom. I have to admit I used more than “a bit” of cardamom because I love the combination with apples. My father says that he loves two kinds of pie…hot and cold apple. I hope the spiced apple sour cream pie twist on his traditional pie will meet his expectations. Make enough pie dough for at least 3 single crust pies to decorate ONE pie. Leaf cut outs are the easiest way to start. I placed several on top of my Pecan Chocolate Pie before I baked it. That was easy and looks like I actually fussed. The pie dough must be COLD at all times. If the dough starts to warm up, place it back into the refrigerator until it is chilled again. Check Intagram and Pinterest for design ideas. Carefully read through all of the helpful hints on Williams-Sonoma Guide to Pie scroll down to “Get Creative with Your Crust”. Judy Kim, food stylist and photographer, has many great and helpful tips. If you don’t have fall leaf cutters, create your own by making a template with cardstock and using that template to cut several leaves or other designs OR come borrow mine. Spiced Apple Sour Cream Pie is a variation of the Sour Cream Apple Pie I posted years ago. You can go to the link to find the step-by-step photo’s and instruction. Begin with rolling out enough pie for two pies. 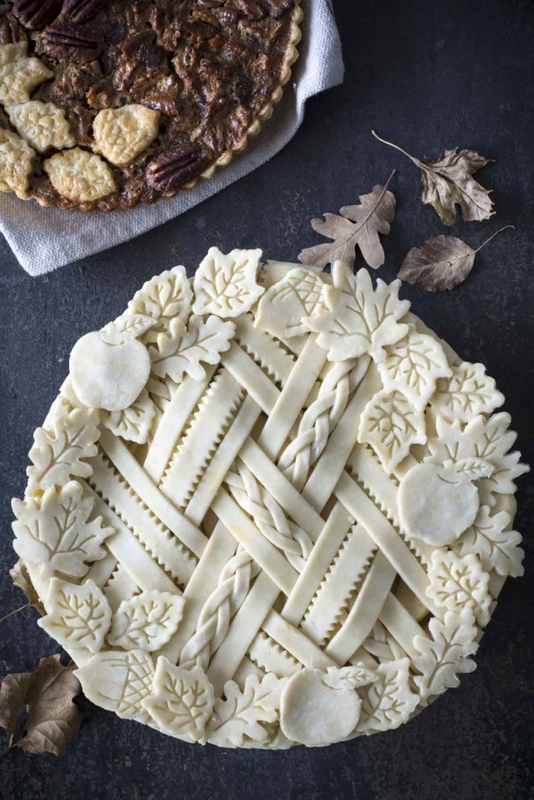 Create and cut shapes and strips for the top of the pie. Place on a baking sheet, cover with plastic wrap, and refrigerate until ready to use. Roll out pie dough for a single crust pie and line a 10 1/2 inch pie dish. Set aside. In a large mixing bowl add sour cream, egg, sugars, flour, salt and spices. Mix well then fold in apples. Set aside. Pour apple filling into pie dish. Make and create decorative top or just roll out a single crust for top of pie. Use beaten egg as a "glue" to adhere strips and cut outs by brushing the backs of the cut out before placing on the pie. 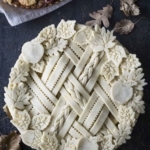 Place decorated pie in the freezer for 20-30 minutes while heating oven to 350F degrees. 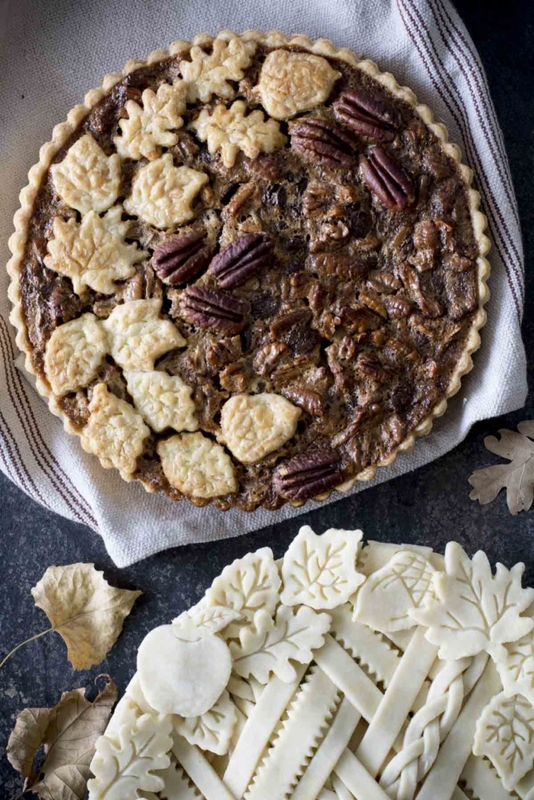 Brush the top of the decorated pie with heavy cream or milk. Sprinkle with sugar if desired. Bake for 50-55 minutes. If the top crust begins to brown too much, cover with a piece of foil. 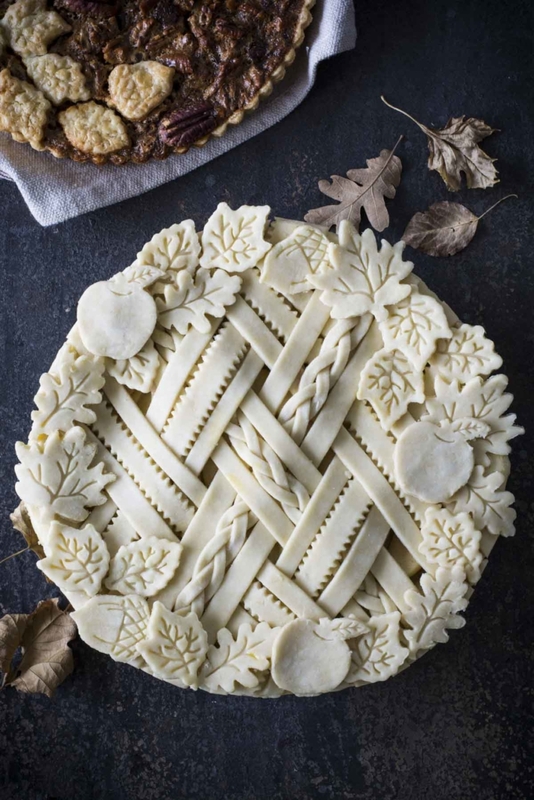 Streusel topping or a plain rolled pie crust may be used in place of intricate lattice topping. THIS pie is not for eating. it should go to the museum of pie. Thank you so much. Ha ha we’re eating it! Happy holidays. After I lay the crust into the tart pan I lift and gently press into place. Then I take my rolling pin and roll it across the top of the ridge of the tart pan and it cuts the dough off perfectly. I believe I have pics of that on the post. Thanks again for your kind comments. Thank you so much for your kind comments. You have made my day. Thanks Janet can you also provide the link for the apple, acorn & maple leaves cut outs please…I have to have them too. lovin’ the plugin! Thanks for choosing cookbook! Thank you so much. The plungin is awesome. Yes but shipping costs just too expensive. Thank you so much. You can find the cutters at Willimas-Sonoma and several on Amazon, if that helps. You can always make your own stencils, but that doubles the amount of work.